Tu is the sixth novel of Māori author Patricia Grace, and it’s quite different to her other novels I’ve read, which have all been firmly grounded in New Zealand. It’s the story of three brothers who go away to war, and of a girl who matters to all of them. Most of the novel is narrated by Tu, responding in his later years to the questions of his nephews Rimini and Benedict. The novel is bookended by his letters to them, with his war diary set in Italy in between, along with the back story of his brother Pita in New Zealand. Tu is much younger than his brothers Pita and Rangi, and he bears the burden of being the chosen one. When their father returned from WW1 he was a damaged man, and his violence blighted their youth. Pita stayed home from school to protect his mother, making his employment prospects even more difficult in a society where discrimination against the Māori was the norm. Quiet, thoughtful and an intensely private man, Pita is nothing like his knockabout brother Rangi, but both of them are determined that Tu will win a native scholarship, get an education and become the hope of the family. This sense of family responsibility amongst the Māori is a motif which recurs after their father dies and the family moves to Wellington: the boys share their earnings to augment their mother’s war widows pension, a pension which was inexplicably half the amount paid to Pakeha women. Between the chapters of Tu’s war narrative, is the third person narrative of Pita, struggling to come to terms with masculinity. He has a paternalistic view of women, is protective of his sisters, and judgemental about women who wear makeup. (This paternalism is irritating to a 21st century feminist, but it was authentic in that period). But Pita is attracted to Jess, a Pakeha who works in the local cake shop, and she is attracted to him. The boys in this family, however, expect to live at home until they marry and when they do so it will be with the approval of their family. He knows Jess is not for him. He is meant to marry Ani Rose, and every time he is with Jess it feels like a betrayal, not only of Ani Rose but also of his family and his culture. He resolves his ambivalence by caving in to the pressure to enlist, because he feels the unspoken criticism that a young man like him should not be doing work that could be done by old men and women, he should be a warrior. There were other reasons he had for joining up. There was something in him, some wrong thing that hurt people or frightened them – something stuck in his works, pulling down inside him like a stiffened claw, which he needed to take to war. There was the mess of himself and what it did to dreams. Although Jess is central to the narrative, she is a shadowy figure. Pita muses on her attractive appearance, and he is uneasy about her pert and independent-minded behaviour. He can’t reconcile Jess’s nonchalance about her family’s disapproval with his own attitudes: his Catholic moral code, his quiet pride in his Māori identity and his desire to follow traditional ways. But the characterisation of Jess herself is muted. Her perspective can only be inferred through brief conversations with Pita. Indeed, the characterisation of all the women is mere backdrop. Ma is devout, devoted and stoic. The two sisters are barely mentioned except as go-betweens for Jess, and the only time Ani Rose asserts herself is to say that she wants to marry Pita before he embarks for war rather than when he gets back. Compared to the dynamic women of Potiki (1986), Cousins (1992), and Baby No-eyes (1998), these women are insignificant. Perhaps it is the author’s way of exploring cultural disruption by showing how women were relegated to insignificance during war. Ma’s role is to maintain heritage links. The girls do war work in factories. But they don’t have anything much to say. The secret that lies behind Tu’s post-war life divorced from his family is all the more shocking for its tragic irony. The reader has been focussed on Jess, and how she comes to matter to all three of these brothers so the revelation is wholly unexpected. It’s remarkable also how well Grace manages to convey a male voice transitioning from hope, excitement and pride to bitterness, shame and despair. She really is a brilliant author. BTW that poignant cover photo is authentic: it’s of John Taua, the only soldier in the Māori Battalion to have been awarded the United States Silver Star for bravery. This is a time for all New Zealanders to celebrate te reo Māori (the Māori language) and to use more Māori phrases in everyday life. In 2016 Māori Language Week runs from 4-10 July, the theme is ākina to reo – behind you all the way, which is about using te reo Māori to support people, to inspire and to cheer on. You can find out more about it, as I did, at Te Taura Whiri i te Reo Māori (the Māori Language Commission) and at the NZ History website. And Irā! you can check out the phrases of the week here. Source: Personal library, found in an Op Shop. Leaving aside the content of the book – and I’m over WWII – I’m not sure I agree with you about the cover. Using a real photo implies (to me) a connection with the soldier pictured. I had the same issue with a photo of Sgt Reg Saunders on the cover of David Ireland’s Burn. Does the photo of one indigenous soldier have to stand for all indigenous soldiers? I take your point – but in this case there is a connection. 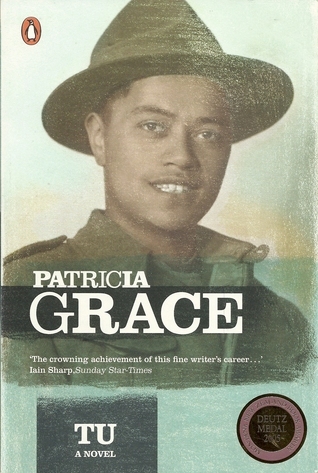 John Taua was in the same Signal Company with Patricia Grace’s father John, and the photograph was in one of her mother’s photo albums. This was my first Patricia Grace novel which was given to my husband by my bookish Kiwi mother-in-law a few years ago. I remember being completely immersed in the story and vowed to read all of Patricia Grace’s backlog. I have since read Dogside Story which is a fascinating depiction of Maori life on the marae. Actually, Baby No Eyes by Patricia Grace was one of the three books I took from my shelves to choose from for your indigenous literature week (along with Kayang and Me by Kim Scott and Hazel Brown and The Swan Book which I ended up reading and reviewing). I must read another of her books and soon! That’s the way I feel every time I read one of her books, and now *pout* I don’t have one waiting on my TBR. I must get a copy of Dogside Boy but in the mean time I’ve just found a copy of Ned and Katrina at brotherhood Books for $9.00! I’m a bit lucky – I also have Potiki and Small Holes in the Silence, along with Baby No Eyes on my shelves. Would you like me to send you Tu? Thank you, that’s very generous of you but I have it already – it’s the only one that I have read that I still own. I gave my copy of Dogside Story to Kim from Reading Matters a couple of years ago. Brilliant review Lisa! Will add it to my ever-going wish list as well as sending a friend your review – she is married to a Maori and is keen to connect her kids with as much Maori culture, in as many ways as possible, as she can. Patricia Grace is excellent at ‘teaching’ about Maori culture and history, I have never been to NZ but I have learned a lot from reading her books. Lisa, I have A book of Selected Stories by Patricia Grace, which I love – I bought it in the 90s – it was published 1991 – from Paradise Books – Surfers Paradise for $7.00. We were on holiday in Currumbin and I found the book exchange. Her stories are so delightful I brought the book home! Her characters believable and her use of English blended with Maori natural and flowing.